This month I signed up for a health challenge disguised as a game. It’s called Health Month. It works like this: give yourself a set of rules (Run at least 10 miles per week, Only allow white flour 2 times per week, etc. ), then track your results daily. If you don’t follow the rules, you lose life points. The goal is to end the month with as many life points as possible, and ultimately discover a healthier lifestyle. If you want to make some healthy changes and you want to have fun doing it, definitely give it a try! One of my rules is to eat greens every day. I consider myself pretty healthy and I thought it would be a breeze to follow the rules. Let me tell you – it is not as easy as I thought it would be! I thought I was already eating greens every day, but having to record my choices made me realize that I wasn’t. And I was losing life points because of it! 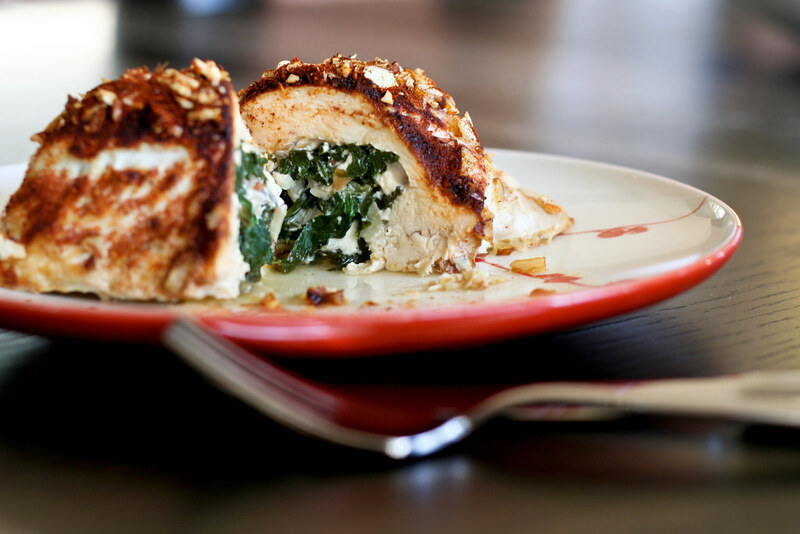 So I was happy to see a recipe for Chicken Stuffed with Spinach, Feta and Pine Nuts in my Cooking Light this month. The perfect way to sneak more greens into my day! Me being me, I adapted the recipe by substituting sliced almonds for pine nuts, and topping the chicken with more chopped almonds and smoked paprika before baking to give the chicken a smoky, toasty and crunchy layer. A great and unexpected way to earn life points. Preheat the oven to 350°. Set a large skillet over medium heat. Once it’s hot, heat 1 tbsp. of the olive oil and add the almonds. Cook for 3 – 5 minutes or until the almonds turn golden. Add the shallots and garlic and cook for an additional 2 – 3 minutes or until the garlic just begins to turn golden. Add the spinach leaves, chicken stock, lemon juice and thyme. Saute for a couple of minutes, until the spinach wilts. Remove from heat, drain any additional liquid and stir in the feta cheese. In a small bowl, mix together the remaining tbsp. of olive oil, the smoked paprika and the chopped almonds. Set aside. Cut a horizontal slit through the thickest portion of each chicken breast half to form a pocket. Split the stuffing evenly among the chicken, then seal with toothpicks and place in a baking dish. Rub the top of each breast with the smoked paprika almonds. Tent the baking dish with foil and bake for 10 minutes. Remove the foil and bake for an additional 10 minutes, or until the chicken is cooked through. Wow, this sounds awesome. First I saw the picture and drooled all over the place. And I don’t drool over chicken, by any means. Then I read the recipe and got all excited! It’s pretty easy, pretty healthy. Definitely going on my list of things to make immediately! I love all the ingredients in this recipe! We are eating lots of chicken and fish now days, so I am bookmarking this recipe and making it soon! Julie – Yeah, I’m definitely not a chicken-lover by any means. I only cook it about once a month or so, but this recipe was a keeper! This sounds really good – love the greek slant. Plus you can’t really go wrong with fresh thyme and smoked paprika – how good does that sound?! Brand new reader – love the idea of the health challenge – and LOVE this blog. I just scrolled down your main page and there isn`t one recipe I don`t want to try. The snapper with corn salsa looks amazing, but everything does. I make a similar recipe that I love, but I might tweak it a little to make it more like yours, I like the spinach and almonds! So great how much spinach goes into a chicken breast, who knew? The paprika is especially genius. Thank you! I don’t know if it is my oven, but it took at least 25 or so more minutes to bake than recipe indicates. This was absolutely the yummiest thing I’ve made this month. With an additional few tablespoons of balsamic vinegar it was the perfect balance with the garlic cloves. And as a college student living on my own, this was super cheap and easy to make. Definite thank you!